For today’s card I challenged myself to use some products which are not my favourites. As a starting point I pulled out some So Saffron cardstock, a colour I very very rarely use. This made me think of straw so I pulled out the Home to Roost stamp set from this year’s Sale-A-Bration selection and also the Garden Impressions 6 x 6 DSP stack which I find a little busy with so many colours included. Here’s what I came up with and actually I quite like it, whowould have thought So Saffron, Calypso Coral and Bermuda Bay would work together. Just a touch of Bermuda Bay has really brought this card to life don’t you think? Being a Yorkshire girl the free Sale-A-Bration stamp set immeadiatly made me think of some of my favourite coastal villages which I’ve visited over the years. Staithes and Robin Hood’s bay being two of my favourties. I stamped the image on watercolour paper and then coloured in select areas with the watercolour pencils. I’ve added more highlights of colour rather than a full coloured image as I wanted the image to stand out from my chosen background. Old Olive cardstock which I’d run through the Bigshot with the Subtle Texture Impressions Embossing Folder to match the effect of the DSP. A little Burlap ribbon adds to the rustic charm of the card and I think finishes it off nicely. By the Bay may not be everyone’s first choice of Sale-A-Bration freebie but I think it worth a look, especially if your like me and love the sea. So if you’re a regular visitor to my blog you may have noticed that I’ve been away for the past couple of months, life got in the way and crafting had to take a back seat but I’m back now and ready to share plenty more crafty ideas with you all. So today I’m sharing a quick and easy birthday card I made with the Sale-A-Bration stamp set Party Pandas, one of my favourites from this years selection. I used a Rich Razzleberry card base with a layer of patterned paper from the Tutti-frutti 6 x 6 dsp pack. This is a great paper pack as there are so many colours included with lovely cheerful patterns on one side and fruity patterns on the other. I have to be honest I’m not a fan of the fruit sides but the others I just love as they are so versatile. I stamped the cute little panda on a Whisper White oval from the Layering Ovals Framelits and matted on a larger scalloped one in Rich Razzleberry. I stamped the balloon on a scrap piece of the tutti-frutti paper and fussy cut it out to give the panda his balloon to pop over the layers. I added a banner greeting stamped from the Birthday Banners stamp set and cut out with the Bunch of Banners Framelits. And here’s a look at the inside, where I stamped a couple of the panda’s balloon’s in the corner and coloured them with the Rich Razzleberry and Calypso Coral Stampin’ Blends. Hope you enjoyed today’s project and if you would like the Party Panda stamp set then just place an order of £45.00 or more before the end of the month and you can choose it as your Sale-A-Bration freebie. 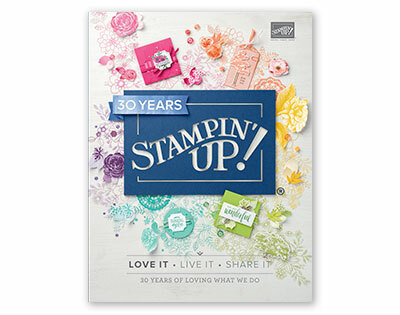 Today I celebrate my first full year with Stampin’ Up! , I’ve loved getting back to crafting with these wonderful products and hope to share many more projects with you over the next year. To celebrate my anniversary I made myself this card, ok I haven’t actually sent it to myself but you know what I mean. Obviously I had to make this card in Mint Macaron as its my favourite colour and I’m so gutter we’ve only got a few weeks left with this gorgeous green. Hopefully I will love the new in colours and find a new favourite among them. If you haven’t already stocked up then now is definitely the time as once that retirements list it will be no more. I chose to use the Reverse Words stamp set which is one of the second release Sale-A-Bration freebies, I love that its such a big stamp and takes the focal point of the card easily. I also did some stamping with the Painter’s Palette set which is one I haven’t reached for in a long time, I love all the various paint swipes in this set. To add a little bit of sparkle I cut one of the flowers from the May Flowers Framelits in the stunning Mint Macaron Glimmer Paper, oh how I love this stuff its so so beautiful. Definitely worth making a £45.00 order over the next couple of days to get it free. Hope you have enjoyed this card and come back again to see what the next year of Stampin Up brings me. 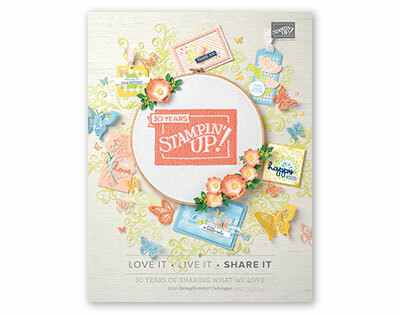 One of the most popular freebiesfrom this years Sale-A-Bration has been the glimmer paper pack. This pack includes 12 sheets of glimmer paper in three gorgeous shades of Sweet Sugarplum, Bermuda Bay and Mint Macaron. This stuff is just stunning and a little bit really makes your card “pop”. The photo really doesn’t do these cards justice as that little bit of glimmer just makes these cards that little bit more special. I used the wave die from the Swirly Scribbles Thinlits as a trellis base for my little flowers. The little flowers were created from the Botanical Builder Framelits in Whisper White and the lovely glimmer paper. The cards were finished with a little greeting from the One Big Meaning stamp set. Which is your favourite colour ? I think mine is the Mint Macaron version, I know I’m going to really miss this colour when it leaves us at the end of May. If you love this colour or any of the 2015 – 2017 In-Colours then now is the time to stock up as these products will be leaving in just over two months and nearly always sell out fast.